When thinking about outer space, the first thing that comes to my mind is this image of unfamiliarity and unknown territory stretching infinitely. When it comes to outer space, we have learned so much, yet we know so little. After watching Carl Sagan's video, Pale Blue Dot, it definitely shifts my perspective and helps me truly understand why our knowledge of outer space is so limited. Sagan's video shows the picture of earth from the greatest distance that it has ever been taken. In the picture we are able to view Earth as a tiny blue dot. This relates to the Powers of Ten video that truly opened my eyes to the power of adding one zero when looking at the world. This actually helped me better understand why making mathematical mistakes when it comes to powers of ten are viewed with such outrage and shock by the scientific community. Being that Earth is our source of life, it is easy to view it as the most important thing in the world, however looking at earth from such a vast distance is an especially humbling experience to realize that we are only a very tiny and seemingly insignificant part of such a vast universe. When relating space to art, in a statements made by Annick Bureaud of The Leonardo Space Art Projec, Bureaud says that artists "reveal the essence of space for human beings in the twentieth century" and they "have been the fuel of space exploration, embodying in their art the dreams of humankind, making these dreams desirable for engineers to achieve." I found this statement to resonate with me because the curiosity, imagination, and passion with which artists perceive the world is truly influential in sparking scientific research to further that curiosity and inspire even more wander. Scientific exploration has been one of the most competitive fields in human history. Countries are constantly competing with each other to see who can acquire the most knowledge the fastest. 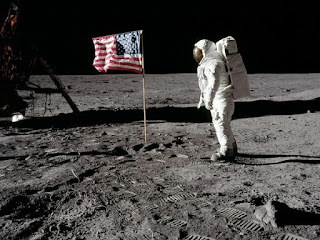 This competition has led to many conspiracy theories that are very interesting to explore, namely the accusation that America's Apollo moon landing video is fake and that it is all an orchestrated, hollywood hoax designed solely to claim that the first man on the moon was an American. Among many other reasons, one of the biggest reasons why this is so controversial is because the flag in the video appears to be flapping as if in a breeze which is impossible in the airless surface of the moon. Space is the one place where scientists and artists can co-exist in peace. 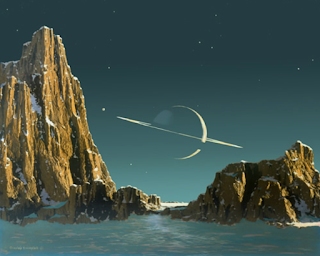 This is because scientists can continue to study space to better understand the universe and its inner workings and artists like Chesley Bonestell can continue to create art that mimics the intricate beauty that lies within space and to help people conceptualize the different concepts and imagery used by scientists. 1. “A Pale Blue Dot.” A Pale Blue Dot. N.p., n.d. Web. <http://www.bigskyastroclub.org/pale_blue_dot.html>. 3. Malina, Roger, Arthur Woods, Annick Bureaud, and B.E. Johnson. "Leonardo Space Art Project Visioneers." Leonardo Space Art Project Visioneers. MIT Press, n.d. Web. 25 July 2016. 4. 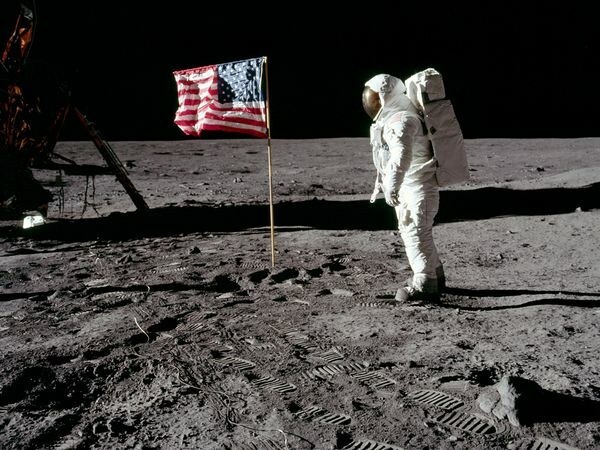 "PHOTOS: 8 Moon-Landing Hoax Myths -- Busted." National Geographic. National Geographic Society, n.d. Web. 25 July 2016. 5. "Bonestell.org - The Art of Chesley Bonestell." Bonestell.org - The Art of Chesley Bonestell. N.p., n.d. Web. 25 July 2016. 1. 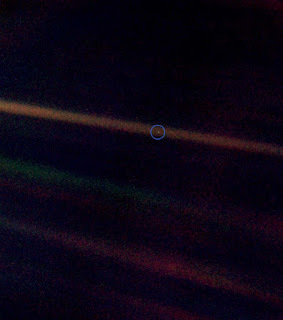 A Pale Blue Dot. Digital image. N.p., n.d. Web. 2. Apollo Moon Landing. Digital image. N.p., n.d. Web. 3. Bonestell, Chesley. Saturn as Seen from Titan, 1944. Digital image. N.p., n.d. Web. I completely agree with many of the statements in your post. Artists do seem essential in the development of engineers who have an interest in space. If you think about it, young girls and boys probably became curious about the universe after watching science fiction shows, movies, and novels. Also, you brought up a good point about the power of ten being very important. Whenever I do calculations and I am off by a power ten, I know that I am making a huge mistake. Generally, these mistakes begin to pile up, which results in a completely wrong answer. In my situation, there is some leniency. However, if someone working on a spacecraft were to do the same mistake, the consequences can be severe or even fatal. Therefore, I can understand why scientists get so upset with even the smallest of arithmetic errors. Overall, I believe that your post did a great job in showing how space is a wonderful place for both scientists and artists. Space may just be the "final frontier" for the third culture between art and science to develop even further. I like how you brought up the conspiracy theory about the moon-landing being fake. I always thought, if they did fake it, they did a great job in setting it up so it is very believable. Regardless, I believe that the image itself set up almost a "stereotypical" image of space and the moon, a vast empty place with no life. Interesting thing is if you ever watch any films before the "Space Race" it portrays space in a very different way. One of this is a 1902 Silent French Film "A Trip to the Moon"